The highly anticipated and final installment of the Batman: Arkham series released its first gameplay trailer today. Batman: Arkham Knight is an action; adventure game developed by Rocksteady studios and based off the DC comic’s superhero, Batman. Originally Arkham Knight was due out this fall, but an announcement made by the @BatmanArkham’s twitter account gave the official release date of June 2, 2015. The second trailer is scheduled for release on December 1st. The trailer highlights several new features in the upcoming game including the much anticipated addition, the Batmobile. 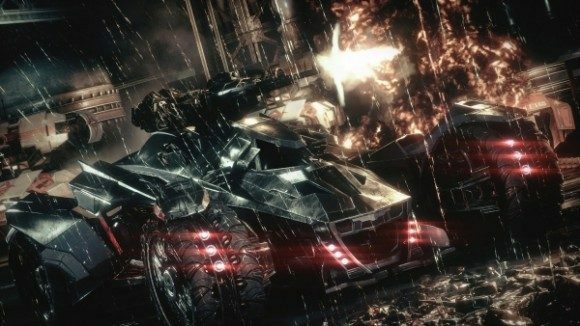 It is a first in the Arkham series, as players have never been given a vehicle quite as unique. The Batmobile is bulletproof, has the ability to smash through barricades or walls; as seen in the beginning of the trailer; shoots missiles, and performs stunt jumps. Players are also able to eject from the vehicle and instantly be able to glide across the city. Another new feature seen in the trailer is the Fear Takedown system. It enables Batman to take down three enemies simultaneously, as long as he’s undetected. Batman: Arkham Knight takes place one year following the events in Arkham City, in which the Joker meets his untimely death. With Batman’s beloved foe out of the way a new or rather old enemy reappears in Gotham. Scarecrow returns to reunite all of Batman’s remaining enemies such as Two Face, Penguin, the Riddler, and Harley Quinn to finally defeat Gotham’s savior. There is another enemy Batman has yet to face and is only known as the Arkham Knight. During the trailer, you can catch a glimpse of this mysterious figure as Batman infiltrates the ACE chemicals plant. Though little has been revealed about this dark antagonist, players can only imagine the havoc this new enemy will wreck on Gotham. The release of the trailer definitely gives players plenty to be excited about for the series finale. Since its scheduled launch date is slated for June, it’ll definitely give Arkham Knight the attention it deserves. Batman: Arkham Knight is available to PlayStation 4, Xbox One, Windows Live, and Microsoft PC. You can pre-order the game on the official Batman: Arkham Knight’s website.